West Chester University Master Plan — Landworks Studio, Inc.
Landworks Studio is tasked with analyzing the main campus and finding the means to bring cohesiveness to the character of the otherwise disparate nature of a developing campus. 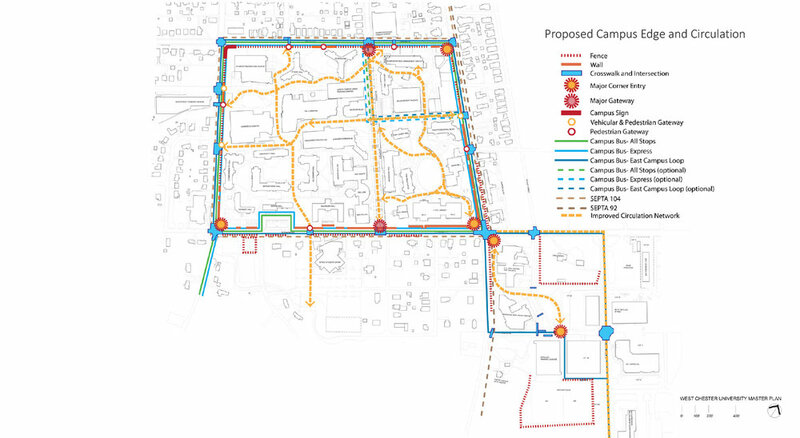 Analysis includes the many factors of spatial uses and program, parking and vehicular circulation, pedestrian and bicycle circulation, planting, lighting and furnishings, the many services on campus, perimeter streetscape character, site lines and entrances, topography, art and landscape features, historical features and what may be green infrastructure. The landscape plan will seek to enhance the sustainable aspects of easy maintainability, storm water handling, efficient lighting, durable materials and robust planting.